I decided to post this set of photos eventhough this was taken last January (more than a year ago). You can obviously see how thin as a paper I was 11 months ago and how much chunk of fat I've gained after those months of eating. Yes I purposely posted this to drive me again to eat moderately and start dieting again.On the other hand, another reason why I didn't post this before was I thought the outfit looked to plain and not blog worthy. But not really, as I've realized this is one of the rare moments I'm wearing something basic -- a pair of skinny jeans and a sheer top. I'm glad my the colors of my necklace and sandals made the outfit looked vibrant and alive. It's probably one of the best fashion trick I love -- to wear something catchy like a pair of statement shoes to make the outfit stand out. Still, I'm lingering on the fact that I should start losing weight again so I could fit in this pair of jeans again. (Yes it won't fit me now). Gotta make this quick! Good night guys. Oh btw, see you at The New Glorietta Vibe Tomorrow! 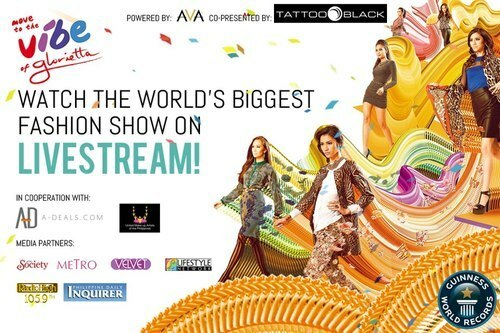 :D We'll be walking the runway with other fashion bloggers there! That is a hot outfit. Black emphasize your complexion. I think it's the first time I've seen you wear jeans. Bagay! Are you kidding me? It's not plain at all...I see some really cute pop of colors here and there. I really like it! But yeah, I did notice the difference...I do check on my older photos too for weight loss motivation. hihihi! For affordable arm candies and clothing. Simplicity is beauty right? You really look beautiful here! :) Aww too bad I didn't go to the Vibe Show :( Hope to meet you soon, bargain doll! ;) I'm a fan right here! Asianvogue Shop, FlauntPH, and Bedazzle Accessories!